You can shoot a .44 Magnum revolver for 6 cents instead of $1 a pop. How? 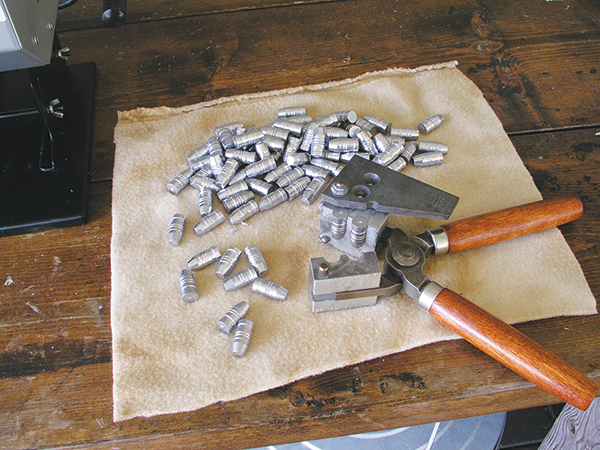 By recycling a fired brass case with a 3-cent primer, 3 cents worth of powder and a free bullet that you cast yourself from scrap lead. No doubt reloading greatly reduces shooting costs, and that’s only one of the benefits. Besides better accuracy, all factory ammo for 9mm, .40 or .45 ACP autoloaders is full power to guarantee proper functioning of the action. Yet most autos will function just fine with a considerably milder reload, and that makes shooting at the range much more enjoyable. Substitute a lighter spring and you may even shoot pussycat target loads in a 1911 .45 ACP. A hunter might only shoot a few rounds of rifle ammunition a year, but handgun enthusiasts tend to go through bullets by the box. Whether it be a revolver or an autoloader, people just enjoy shooting their handguns. And while the other benefits of reloading are considerable, to realize the full potential savings, you need to take the next step and start casting your own bullets. Casting bullets can be a great summertime hobby. I say summertime because while it is possible to safely cast bullets with proper indoor ventilation, most hobbyists are better served just doing it outdoors where the lead fumes naturally waft away without presenting health risks. To get started, ask around and locate some local sources for free or inexpensive scrap yard lead. Do you know any plumbers? How about the balancing weights in old car and truck wheels at a local junk yard? These lead wheel weights were once my preferred bullet material, although in recent years I’ve been finding too much junk metal in the new ones. Plain, soft lead is preferred for muzzleloader round ball and shotgun slugs, so they readily mushroom in deer and other game at lower velocities. But handgun bullets are typically cast with up to 2 percent tin added to harden the lead a bit. This improves shooting performance and penetration on big game at handgun velocities. 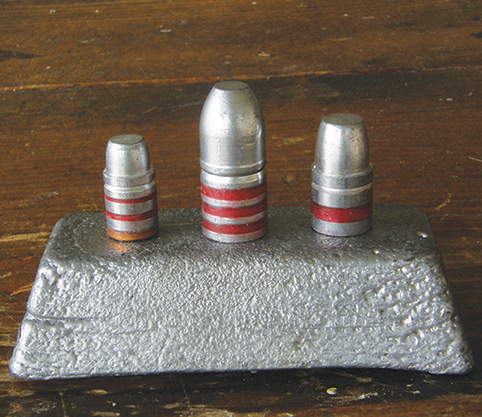 Cast lead bullets may be further hardened by adding antimony or with heat-treating. The best handgun bear bullets I know are “hardcast” this way. They have a flat or mostly flat nose, known as a meplat, that provides a just-right balance of punch and deep penetration. Such bullets are intentionally made so hard they do not mushroom, instead maintaining that original shape to assure penetration. Hardcast bullets are also preferred for autoloaders. Proper alloy mixes for hardcasting are available by the pound, and while I long used my own hardcast bullets for hunting, lately I have been using them only at the range. For hunting, I buy relatively inexpensive hardcast bullets from Cast Performance Company. I do this to absolutely ensure they are the just-right hardness for game animals, not too soft and not too brittle. These heavy hardcast bullets are my choice for deer and bear with a .357 or .44 Magnum. They develop slightly higher velocities than equivalent-weight jacketed bullets and are, for all practical purposes, equally accurate. In .44 Magnum, I prefer a 240-grain bullet for deer and a 320-grain for bear, or maybe a 320 for both. Again, these hardcast bullets do not mushroom; they already are the perfect shape to balance punch and penetration. While only a few hunters cast bullets for high-speed rifle cartridges like .270 or .30-06 (typically for lighter loadings), hunting deer with cast bullets in a slower .30-30 is surely an option. A .44 Magnum lever-action carbine with cast bullets makes a dandy woods rifle. A Marlin lever action .45-70 loaded with 400-grain hardcast bullets should make a great bear stopper. For shooting steel plates with a single-shot .45-70, I cast 300-grain bullets and then load them at a mere 800 feet a second to all but eliminate felt recoil. Redding, Lyman, Lee and RCBS all make the equipment. Lee tends to make budget gear while Redding, Lyman, and RCBS compete for top-end quality. Considering the savings once you are in operation, the cost of reloading equipment is quickly recovered. Same as with optics, I advise buying the best you can afford to minimize upgrade costs later. But you can start out using any heavy-duty steel cooking pot or perhaps a cast iron pot to melt the scrap lead. For an outdoor heat source, use a camp stove or perhaps the side-burner on a gas barbecue grill. Do not try to melt a pot of lead over an open fire as it is difficult to control the heat properly and also potentially dangerous. I like to melt a pile of scrounged lead in a large pot and then skim off everything that floats. Dirt and even the steel in wheel weights will float to the top in molten lead. Then I add about 2 percent tin and pour this mix into an ingot mould. I store the “pure” ingots and use them for later bullet casting. Most of the smell is removed with this first melting. You will need a special casting thermometer as you will be working with molten lead at temperatures of 600 to 700 degrees. 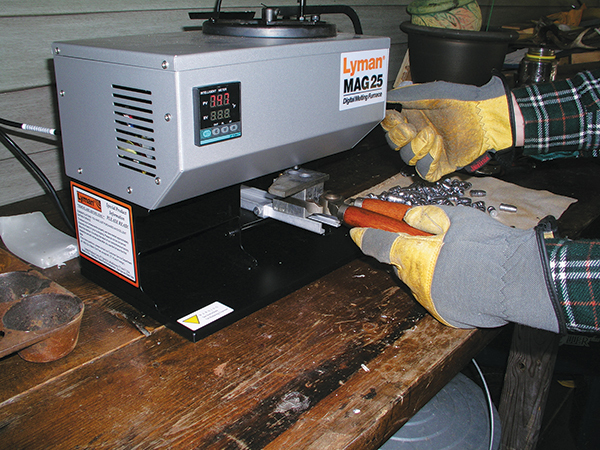 There are low-cost thermostatically controlled electric heating pots, and Lyman makes a high-end digital melting furnace (OK, pot). But I still advise a thermometer for checking things. I also advise reading a book about bullet casting for all of the little hints. Wear gloves, an apron and safety glasses. 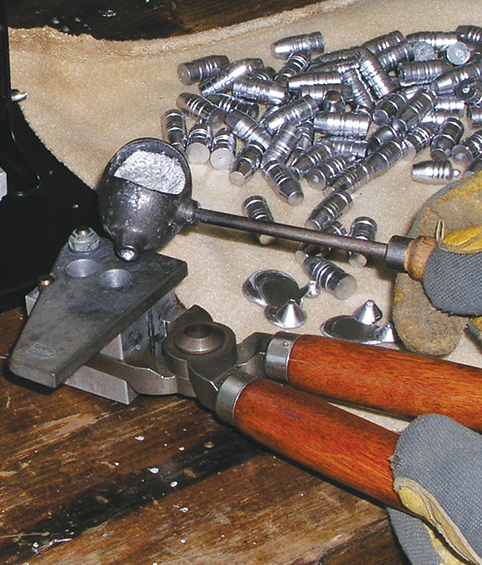 To transfer molten lead from the pot to the bullet mould, use a small dipper designed specifically for doing this. They aren’t expensive, and tipping the half-round scoop sideways allows molten lead to pour out through a small hole in the side of the scoop directly into the bullet mould. Bottom-pour pots dispense lead directly into the mould through a small hole in the pot itself, foregoing the dipping. While some folks prefer the dipper, most find a bottom-pour pot to be an upgrade well worth the cost. Steel and aluminum moulds are made for every caliber and bullet style you can imagine. There are single- and double-cavity moulds, even six-cavity moulds. Steel moulds are more rugged, but a careful caster need not spend the extra money. The molten lead solidifies in the mould in just a few seconds. Then the mould handles are separated and the bullet or bullets drop out; sometimes they need a little coaxing with a light tap by a wooden dowel. Arrange a towel or other soft cloth to catch the hot bullets when they drop out. The first few bullets poured will likely be imperfect. Once the mould heats up and starts casting better bullets, keep going until the pot runs low or dry. You can recycle those first misshapen bullets by carefully dropping them back in the pot. Most moulds cast reasonably uniform bullets. However, a sizing tube of precisely proper bullet diameter should be used to check the bullets for uniformity. This is easily done by simply pushing bullets through or levering them into and then back out of the sizer. When fired, cast lead bullets tend to leave lead fouling in a gun barrel’s bore. Bullet lubricants minimize this, and soft lubricants may be wiped into the grooves in a cast bullet. Some lubes are the consistency of heavy grease; others are not at all tacky. Regardless, a combination sizer/lubricator may be used to simultaneously true the bullet and squirt lube into the grooves. Eventually, you’ll probably want one of these, too. We’ve been shooting at a bank in my backyard for 20 years, and there must be 100 pounds of lead waiting there for the digging. A bullet trap might be a dandy investment at a home range, allowing easier recover and recycling of fired bullets. Once you get everything set up, you can shoot the same lead forever.